With most attention at the Ducati stand being lavished on the 1299 Panigale, the updated Multistrada almost went unnoticed. And that’s understandable given the Panigale’s brilliant performance figures and the fact that the Multistrada doesn’t look dissimilar to its predecessor. Instead, the major changes came with the Multistrada’s massively expanded equipment and driver aid set-up. 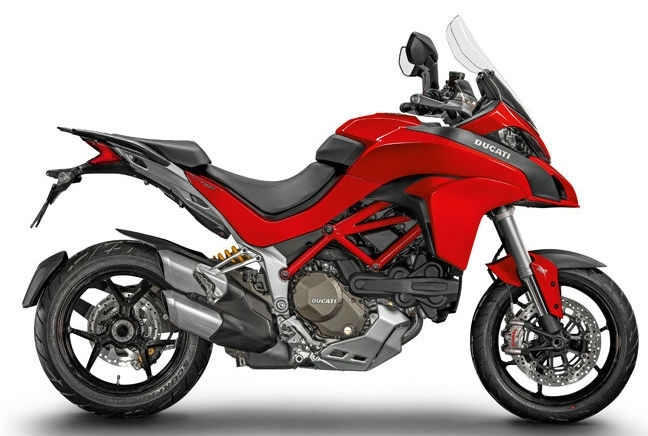 The new Multistrada comes complete with a Testastretta DVT system, ABS and LED lights as standard, however there are a raft of more premium additions that really pricked our attention. There’s an Inertial Measurement Unit (IMU) that measures roll, pitch and yaw before working with other systems to keep you upright. Then there’s electronic cruise control and Bluetooth and Multimedia options on higher trim levels as well as an eight-level wheelie control system. All in all it makes for a sophisticated package and an intriguing option when it rocks onto UK shores next year.